Let's get up to speed about this chip giant's significant dividend. Chip giant Intel (NASDAQ:INTC) isn't shy about giving the free cash flow it generates back to its shareholders, in the form of quarterly dividend payments and share repurchases. Let's consider the key things current and potential investors in the chip giant should know about the company's dividend today, as well as what could be in store for the dividend. How much is Intel's dividend? As of this writing, Intel's quarterly dividend is $0.30 per share, good for $1.20 per share on an annual basis. 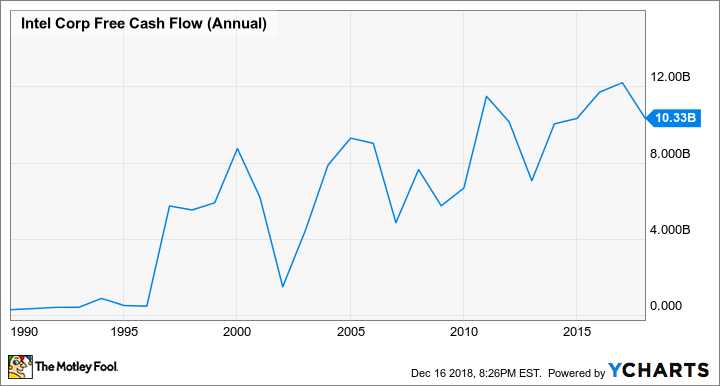 The raw dividend payment in itself isn't terribly helpful without knowing what percentage of the company's share price that dividend is good for -- a metric known as dividend yield. Intel's shares recently closed at $47.86, and at that price the $1.20-per-share dividend is good for a dividend yield of just under 2.51%. Put another way, if you were to go buy a share of Intel stock for that price and if Intel kept paying its current dividend for as long as you held it, you'd get back 2.51% of your initial investment each year. In an ideal world, a company would steadily increase its dividend every year, meaning that as the dividend grows, the yield rate based on an investor's original purchase price goes up. Imagine, for example, that Intel's annual dividend payments rise to $2.00 per share. An investor who bought at $47.86 and held would see his or her dividend yield grow to almost 4.2%. How often does Intel increase its dividend? Since 2013, Intel has done a good job of giving its shareholders annual dividend increases. But its track record isn't perfect. Intel's quarterly payout remained parked at $0.225 for a stunning 10 quarters between the dividend declared on July 25, 2012, and the one on Sept. 11, 2014. Why? Because after Intel turned in a record year in 2011, the company struggled in 2012 and 2013, posting two straight years of revenue and net income declines thanks to a weak PC market. In 2014, the company returned to growth, so it's little surprise the company felt it could start raising its dividend again. From a financial perspective, 2018 is going quite well for the chip giant. The company's most recent guidance calls for revenue to hit $71.2 billion, up from $62.8 billion in 2017; non-GAAP earnings per share to reach $4.52, up from $3.46; and for free cash flow to climb to a healthy $15.5 billion, up from $10.33 billion in 2017 and the highest it's ever been for the chipmaker. So as I argued back in late October, Intel investors should expect a healthy dividend increase the next time the company updates its dividend, which should be in early calendar year 2019.